Mad Hatters Tea Party in aid of Marie Curie! Don’t be late for this very important date! On Friday 7th April from 12 – 2pm Blythe Valley Park will be hosting a fantastic Mad Hatters Tea Party on the lawn….with all proceeds raised going to Marie Curie West Midlands Hospice. All food and drink is FREE! We just ask that on the day you donate to Marie Curie, either in person or on our just giving page….so bring your cash 🙂 click read more to find out details. 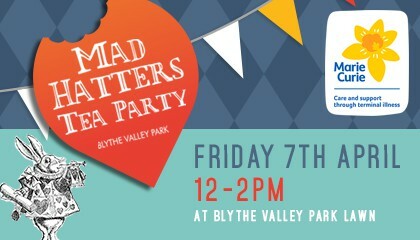 We are putting on a wonderful Mad Hatters Tea Party on Friday 7th April, you’d be mad to miss it! Come and celebrate your very merry unbirthday with us and raise money for Marie Curie! There will be undercover seating available in our beautiful marquee – so don’t worry if there are some April showers! Please remember to bring cash with you…not for the food & drink….but to donate to Marie Curie West Midlands Hospice. Our local hospice based in Solihull is treating and caring for people with terminal illness, and doing an amazing job. We want to raise enough money throughout 2017 to ‘pay for a day’ (which is a total of £7321) we need your help! To put this into perspective: it costs £20 for a Marie Curie nurse to give an hour of care. Please be generous!